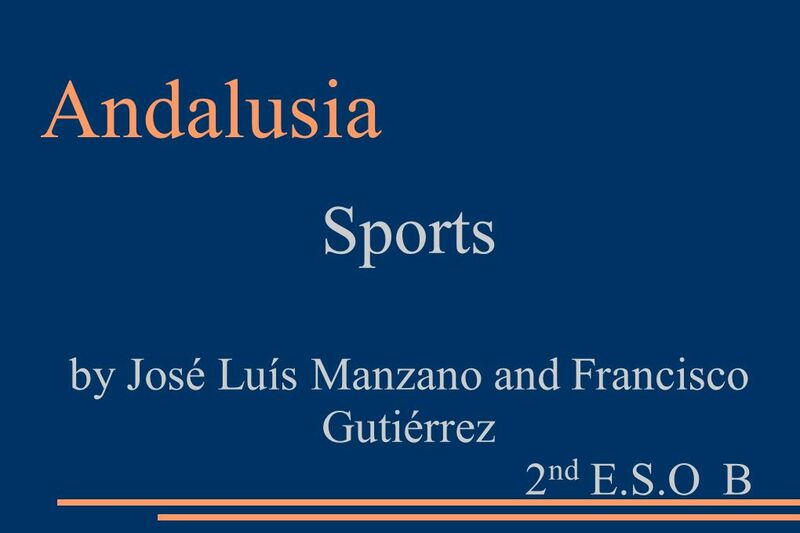 Andalusia Sports by José Luís Manzano and Francisco Gutiérrez 2 nd E.S.O B. 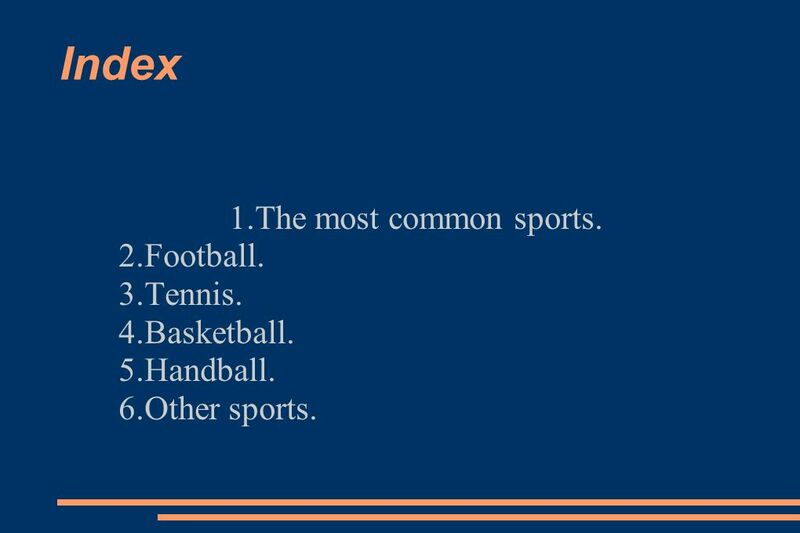 2 Index 1.The most common sports. 2.Football. 3.Tennis. 4.Basketball. 5.Handball. 6.Other sports. 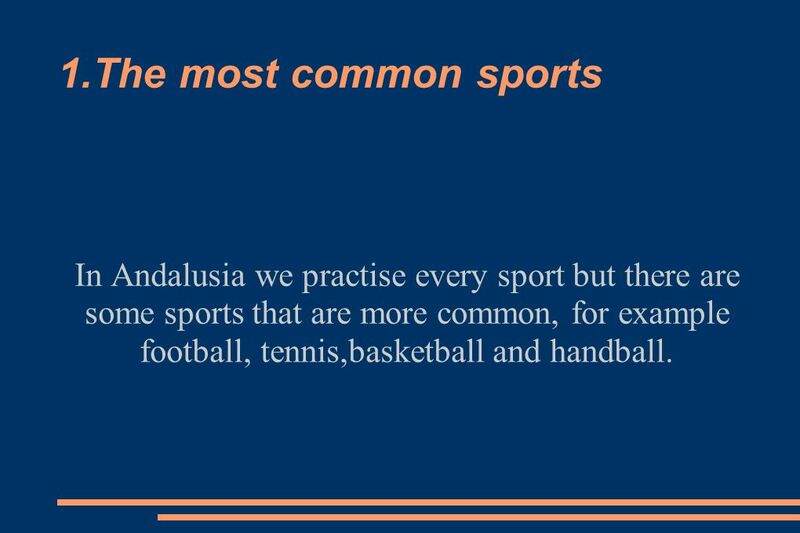 3 1.The most common sports In Andalusia we practise every sport but there are some sports that are more common, for example football, tennis,basketball and handball. 4 2.Football. 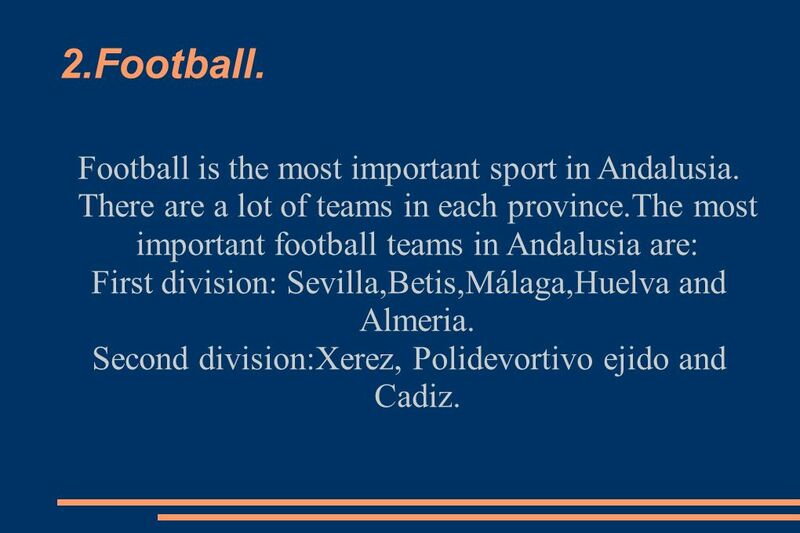 Football is the most important sport in Andalusia. 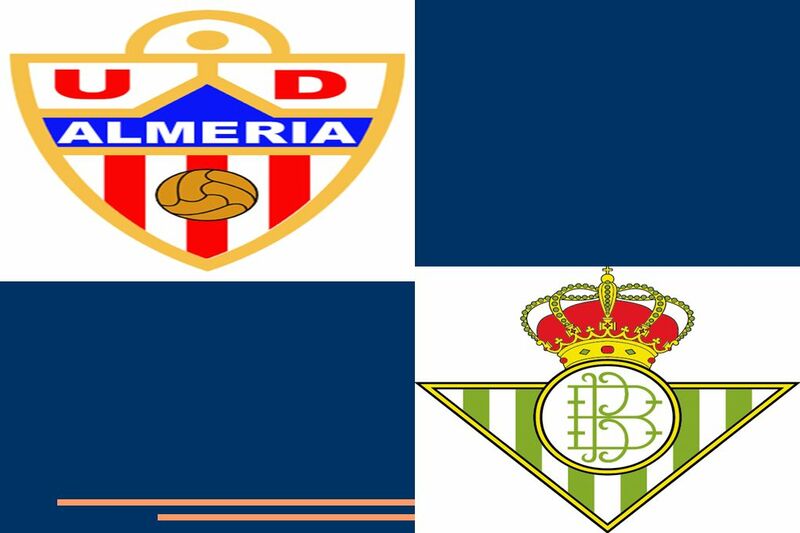 There are a lot of teams in each province.The most important football teams in Andalusia are: First division: Sevilla,Betis,Málaga,Huelva and Almeria. Second division:Xerez, Polidevortivo ejido and Cadiz. 6 3.Tennis. 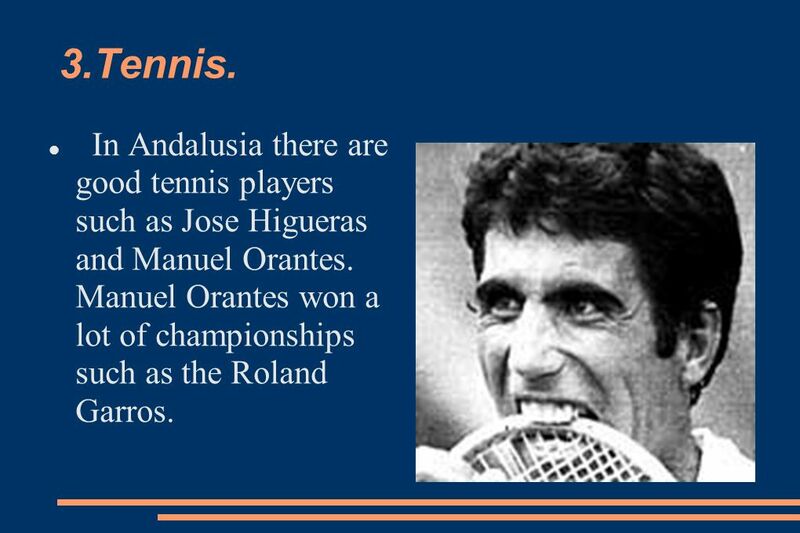 In Andalusia there are good tennis players such as Jose Higueras and Manuel Orantes. Manuel Orantes won a lot of championships such as the Roland Garros. 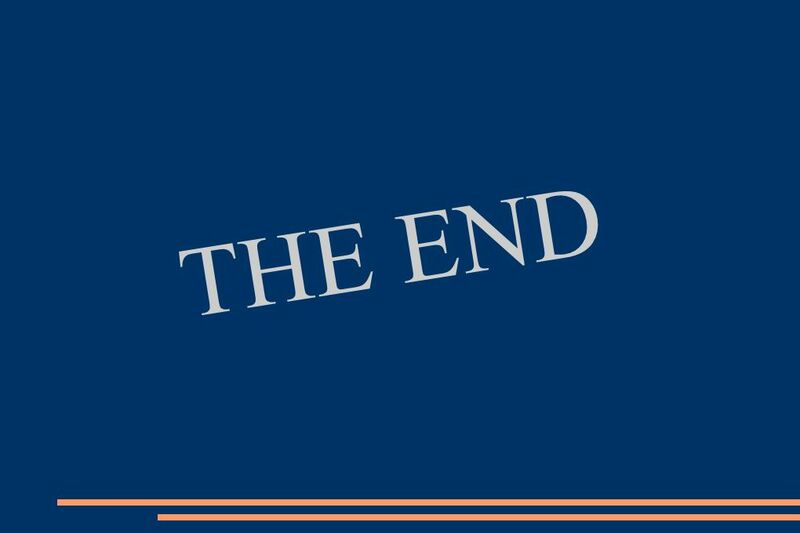 8 5.Handball. In Andalusia and in Spain too,the most important league is the Asobal League. 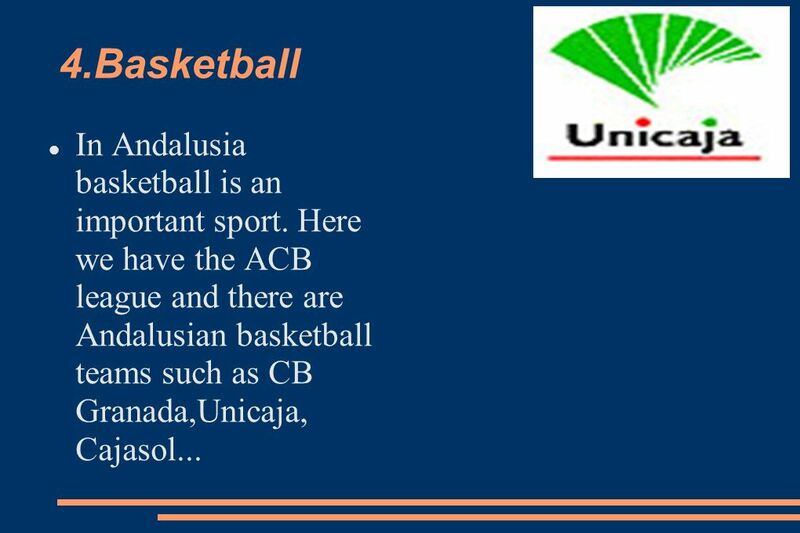 In Andalusia there aren't important teams. 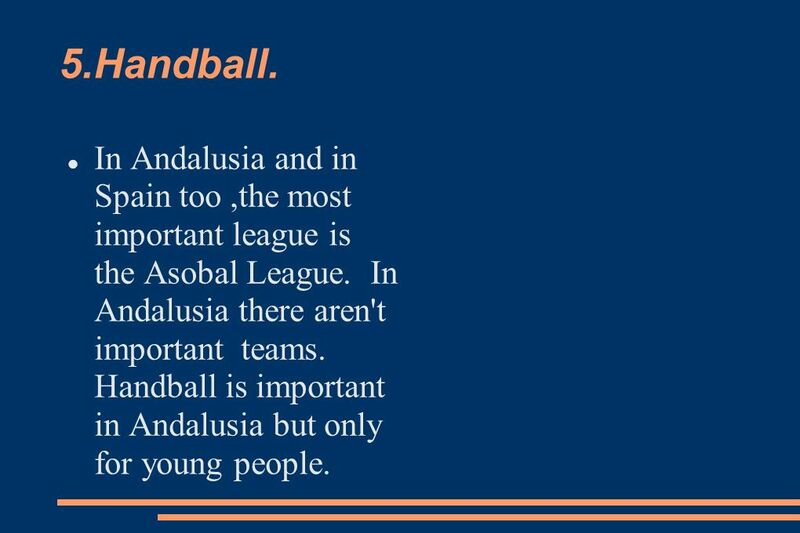 Handball is important in Andalusia but only for young people. 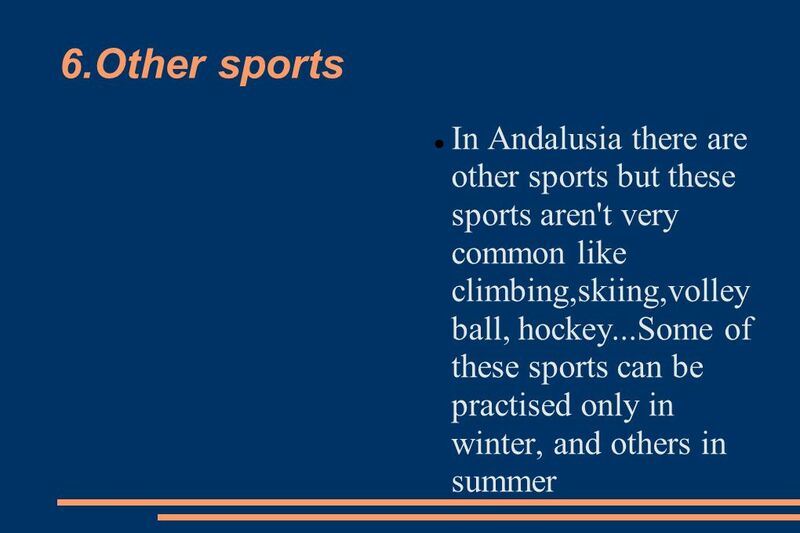 Download ppt "Andalusia Sports by José Luís Manzano and Francisco Gutiérrez 2 nd E.S.O B." Sports in modern years Maria A.. In modern years all of the people are allowed to take part in every sport. There are sports for rich and other for poor. SCHOOL ST. JOHN THE BABTIST SPIŠSKÉ VLACHY SCHOOL SPORTS. Comenius Project Madrid, Spain Sports Model Experimental Junior High School of the University of Macedonia Thessaloniki, Greece Irene- Agapi Gounopoulou. What Is the most famous sport in France? Billy J Vasquez Period 1. There are only two sport club in Nyíregyháza: Choose either of logos.  The most popular sports in the Czech Republic are football and ice hockey.  Football –tennis is an original Czech sport similar to volley-ball in.  Sport is synonymous with health and well-being, topics that we take on as a goal to improve our quality of life.  Sport is a synonym of discipline and. Sports The people in Sweden have many options to practise all kinds of sports. We’re going to tell you about a few of these. World Cup Soccer Team Spain By: Student A and B. Spain Located in Europe Its capital and largest city is Madrid The country’s total land area is 499,400. Czech Republic PARDUBICE. Pardubice is situated on the bank of the second longest river in the Czech Republic, the Labe River, where there is a mouth. Baseball, Basketball, Crew, Football, Hockey, Lacrosse, Soccer, etc. Baseball, Basketball, Crew, Football, Hockey, Lacrosse, Soccer, etc. Lots of Funding.